It was a back-to-reality Monday after being away for 2 weeks and I needed an easy dinner that would work for today and give me leftovers for tomorrow. This combo couldn’t be better! 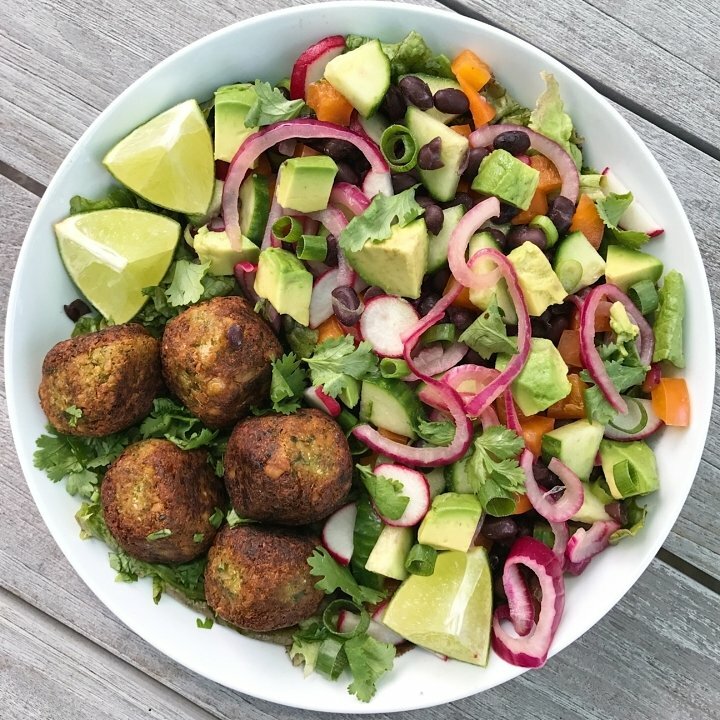 Mexican Chopped Salad, recipe fromThe Crunchy Radish, and Mexican Vegan Falafel Bites, recipe from Cotter Crunch. The Mexican Falafel Bites are on repeat in our house. We’ve made them several times because my husband and I both love them. The recipe is nearly grain-free using just 2 tbsp of gluten-free flour and a base of broccoli/ cauliflower rice, and the falafels are flavored with jalapeño, cumin, cilantro. They are particularly good with the Cashew-Lime Dressing from the salad. The boys aren’t big fans of falafels so we made a batch of grilled shrimp for the boys which actually worked really well with the salad. Grilled Chicken would work equally well.